The Heidelberg Police Department (HPD) wants to remind everyone that with summer approaching and the return of warmer weather, many people have a tendency to driver faster than in winter weather’s snowy and icy road conditions. Be aware and be careful. With the warmer weather also comes children at play throughout the Borough. Heidelberg has three parks where children play and extra care should be taken while driving near the Borough’s parks. Children playing baseball, soccer or hockey often run into the street, commonly running between parked cares to get on to the street. Parents need to take extra vigilance over their children at this time of the year and know where they are and what they are doing daily, on a regular basis. It's easy to blame someone else when a child is injured by a motor vehicle, but a better solution is for parents to know where a child is and where he/she is playing. Let us all teach the young the proper way to cross a street, look both ways first. Keep in mind that unless otherwise noted, the speed limit within the Borough is 25 MPH. We all know that we all drive too fast and many of us do not obey speed limit signs. However, we all need to share the roadway with cars, motorcycles, bicyclists and children. For our mutual safety and welfare, let us all try and be courteous and smart as we negotiate the roadways of the Borough. Remember your state bicycle laws which are found in the motor vehicle code manual. Always keep in mind that state law dictates the proper, safe distance that a motor vehicle driver must maintained between a bike rider and a motor vehicle on a roadway. In the same respect, cyclists are required to obey the same traffic laws as motor vehicles while riding bikes on a roadway, and cyclists can be issued citations for violating the same traffic laws as a motor vehicle driver can. Even through texting and driving is against the law, and is treated as driving while impaired by state law, drivers still do it on a daily basis. Keep in mind all the state laws regarding the use of social media while driving. New technology is in the works and will be available shortly whereby police, while investigating a motor vehicle accident, can plug a cell phone into a police vehicle laptop to determine if a driver was texting at the time of an accident. On a similar note, many vehicles are equipped with digital dashboard cameras as a means of documenting who was at fault during an accident, road rage incident and other criminal activity. Families going on vacation during the summer months can stop at the Police Station and fill out a “Vacation Watch” form prior to leaving. This form informs the HPD as to when you will be away and empowers them to make extra checks of your residence while you are gone. In addition, you can list emergency contact numbers on this form should you need to be contacted while away. One last Note, the Heidelberg Police Department’s Annual Fishing Derby will be August 6th, 2016 in Chartiers Creek along the border of the Borough. Registration will begin at 7:30AM at the Heidelberg Park Pavilion. PA Fish Commission Regulations Apply in regards to Licensing. This is a Family Fishing Derby, parents or guardians must remain with children or young adults during the entire derby, including the awarding of plaques and prizes for best fish caught in a number of categories. A registration fee required to participate. Chief Vernon M. Barkley . Heidelberg Volunteer Fire Department's Annual Fund Drive starts January 30, 2016! HVFD is a non profit organization that provides fire safety and protection to the Borough and supports to our surrounding communities. The fund drive provides the Department with 15% of its yearly operating costs. It helps HVFD ensure that its firefighters and EMTs are trained to save lives and have the proper Personal Protective Equipment to protect their safety. For more information, please call 412-292-6710. With great sadness, we report that on June 29, 2015, K9 Officer Rocky lost his battle with cancer. 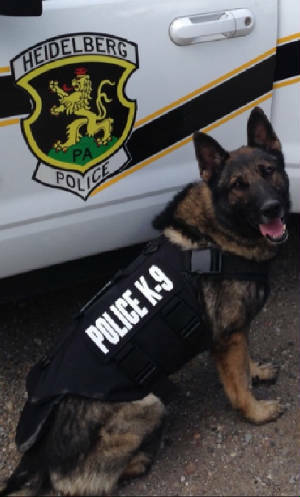 K9 Officer Rocky has been a beloved member of the Heidelberg Borough Police Department since 2008. Rocky attended the City of Pittsburgh K9 Academy with his handler Sgt. Dennis Dixon. Rocky is survived by his partner Sgt. Dennis Dixon, with whom he worked and resided, Sgt. Dennis Dixon’s wife, and their three children. K9 Rocky was intense, intelligent, and loud. He was the ultimate defender and always stayed in the fight. At work and at home K9 Officer Rocky protected the herd- he was the ultimate Sheepdog. 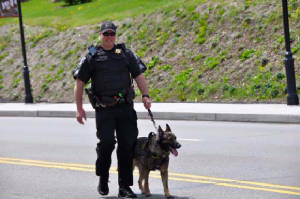 K9 Rocky was loved by his partner, family, fellow officers, and community. All the love and support was sincerely appreciated. A memorial for Officer Rocky will be held on Friday, July 24, 2015 at 10:00 AM in the Heidelberg Fire Hall, 456 1st St. Please join with us as we recognize and celebrate Rocky for his service to our community. The Allegheny County Vacant Property Recovery Program offers opportunities to purchase vacant and blighted properties. For a limited time, this program is accepting applications to acquire vacant properties for side yards to owner occupied primary residences and blighted structure remediation at reduced costs. Sewer Payments are currently not being accepted at the Borough Office. Please mail your payment via check or money order to: BOROUGH OF HEIDELBERG, PO BOX 729, BLOOMSBURG, PA 17815. Recently Renovated Office Space Available for Rent. 2,750 Square Feet, new carpet, fresh paint, newly built two executive offices, remodeled bathroom, kitchen, conference room, and new off-street 8-spot parking lot. Located above the Heidelberg Community Room at 1639 East Railroad Street (on newly revitalized PA Route 50) in Heidelberg Borough. Included with lease include water, sewage, and snow removal. Tenant responsible for gas, electric, trash removal and janitor service. Heidelberg is ideally situated as the gateway to the South Hills of Pittsburgh, conveniently having its own exits off of the Parkway West (I-376) and I-79. The Borough is surrounded by a strong economic base rooted in many solvent communities such as Nevillewood, Mt. Lebanon and Upper St. Clair. The population base within a five mile radius of Heidelberg is in excess of 194,095 people. Heidelberg is a safe, strong and deeply rooted residential community, with a very proactive, efficient and business friendly local government. Strategically located midway between Downtown Pittsburgh and the Airport, Route 50 traffic counts – 18,000 cars daily. 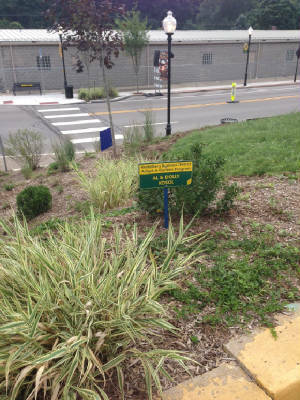 Made possible by the revitalization of Route 50 in Heidelberg, there are now a series of ten garden areas along our core business district that need tending to. Heidelberg Borough is seeking interested volunteers to become special Garden Tenders for the public garden beds along Route 50. The duty of the Garden Tenders will be to routinely weed, water and provide simple upkeep such as litter-getting of their adopted garden bed. To recognize your garden adoption, a sign will be placed in your respective garden stating that this garden is adopted by you, your family or business. If you are interested in volunteering to become a Heidelberg Garden Tender, please contact Joe Kauer, Borough Manager at 412-276-0363 and let him know what garden area you are interested in adopting. 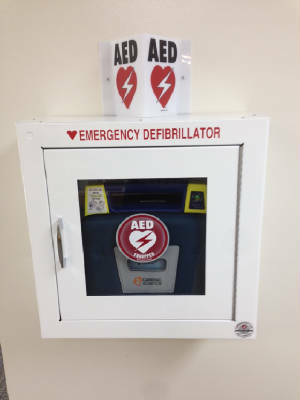 Heidelberg Community Room Now Equipped with Life-Saving A.E.D. Thanks to an $1,800 grant from St. Clair Hospital, the Heidelberg Community Room located at 1639 East Railroad Street is now equipped with a life-saving Automated External Defibrillator (AED). “Our Community Room hosts many public gatherings including town meetings, community events, social activities and is also home to our Historical Society, and now with the help of St. Clair Hospital it is now properly equipped and ready for a sudden cardiac emergency,” stated Council President Rick Pattinato. Heidelberg Borough thanks St. Clair Hospital for their support and generosity. To Work for You and Your Community! As a resident of Heidelberg Borough your PSD Code is 730503. Forms are available at www.jordantax.com/forms. Heidelberg Borough is now on Facebook. We urge residents, business owners and anyone interested in Borough government to become our friend on Facebook. The Borough will be posting reminders, news-flashes and other community events on our "Wall". Search us as "Heidelberg PA"